Prominent Arab-Israeli lawmaker Ahmad Tibi reaffirmed his refusal to serve in “any government”, and declared his intention to upgrade the status of the Arab minority “from the outside,” in an exclusive interview with i24NEWS and Israel Hayom on Sunday evening. “I cannot be part of any government taking for example a decision to attack Gaza or to support huge budgets cuts in settlements or to confiscate land or to destroy houses in the Negev,” Tibi continued, referring to matters directly impacting Palestinians living in the West Bank and the coastal enclave. In January, a survey published by the non-profit Abraham Initiatives found that nearly two-thirds of Arab-Israeli respondents (64%) were in favor of Arab parties joining a coalition. Acknowledging the poll, Tibi said it was part of his “collective responsibility” to boycott participation in a Knesset government. 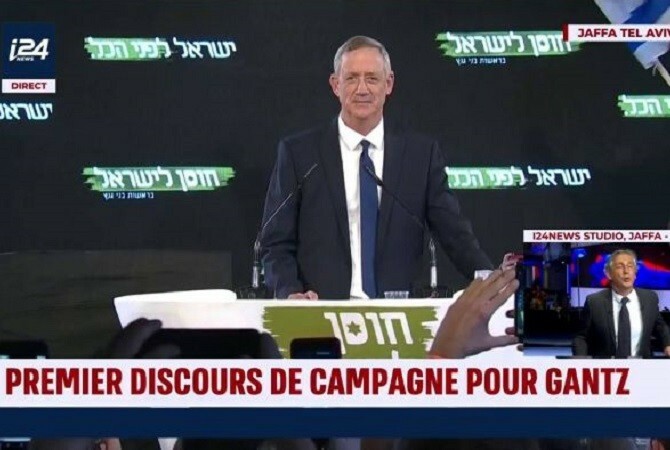 Turning to former-IDF chief Benny Gantz, dubbed as the most powerful challenger to incumbent Prime Minister Benjamin Netanyahu in the run up to the April 9 elections, Tibi expressed disregard for the former’s recently published campaign video on Gaza. The Israel Resilience party video boasts that the IDF destroyed more than 6,000 Hamas targets under Gantz’s command during the 2014 war with Gaza sending parts of the Palestinian enclave “back to the Stone Age”. “We decided and we declared we are going independently,” he reiterated to i24NEWS, explaining that the Joint List had come under criticism from those within the Arab-Israeli community in Israeli. The Joint Arab List was initially an alliance of four Arab political parties — Hadash (led by Ayman Odeh), the United Arab List (led by Masud Ghnaim), Balad (led Jama; Zahalka) and formerly Ta’al — that was formed in 2014 as a response to the raising of the electoral threshold from 2% to 3.25% in 2014. The future of the Arab List first became uncertain in January when Tibi announced his decision to fragment. Whilst remaining mum on his rationale at the time, analysts and MK’s interpreted his move as a tactical attempt to flex his muscles and expand his parties strength on the list. Trailing his decision had been a disagreement among other Arab parties regarding Tibi’s push for open primaries for Joint List candidates. The other three parties reportedly rejected the demand to include the wider public in the process of determining the representation that each party received in the union. Prior to Ta’al’s splintering, the Joint-List constituted the third-largest bloc in the 20th Knesset after winning 13 seats (10.5% of the total vote) in the 2015 election. Results of the most recent jointly-commissioned Israel Hayom-i24NEWS poll on Sunday indicated that the move could constitute a risky gamble. When voters were asked “if elections were held today, which party would you vote for?” that Ta’al only attracted 2% of the voters. This translates into three mandates, placing Tibi’s party inches short of the electoral threshold. It has been criticized it as illogical and lacking rationality, arguing that the Joint Arab List in its entirety constitutes more of a challenge to the current government than in isolation. The separation between the four parties could, in theory, lead to a loss of support among Israeli Arabs, whose vote turnout is often quite low. Ta’al is known in English as the ‘Arab Movement for Change.’ According to the Israel Democracy Institute, the party supports the Israeli-Palestinian peace process with a view towards the establishment of an independent Palestinian state and a just solution to the refugee problem. The party, which also describes itself as secular, also works to reduce the gaps between Israeli Arabs and the Jewish majority and seeks civil equality in all areas of life. Tibi, viewed as the most senior Arab MK having served since 1999, currently serves as one of ten deputy speakers of the Knesset representing the Arab-Israeli MK block. He formerly served as a political adviser to the former Palestinian President Yasser Arafat from 1993 -1999. He is a trained physician, graduate of Hebrew University of Jerusalem with a degree in gynecology.